As one of the highest concentration of ethnic Chinese or locals “Tionghoa”, in West Kalimantan the Singkawang city provides the Spectacular Magical Tatung and Dancing Dragon during the Chinese happy New Year with its Cap Go Meh – Imlek – Xong She Fat Xoi. The most attractive traditional musical instrument displayed on special occasion of: Xong Xi Fat Choi or Wedding party. 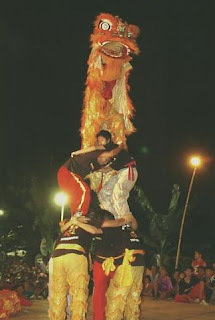 Amazing Singkawang Chinese Tionghoa Dancing Dragon with the Magical Tatung.